This is a 1975 Parker 75 cartridge/converter-fill in Smooth Gold-Plate. Smooth Arrow clip (no feathers on the arrow). Dimpled tassies. 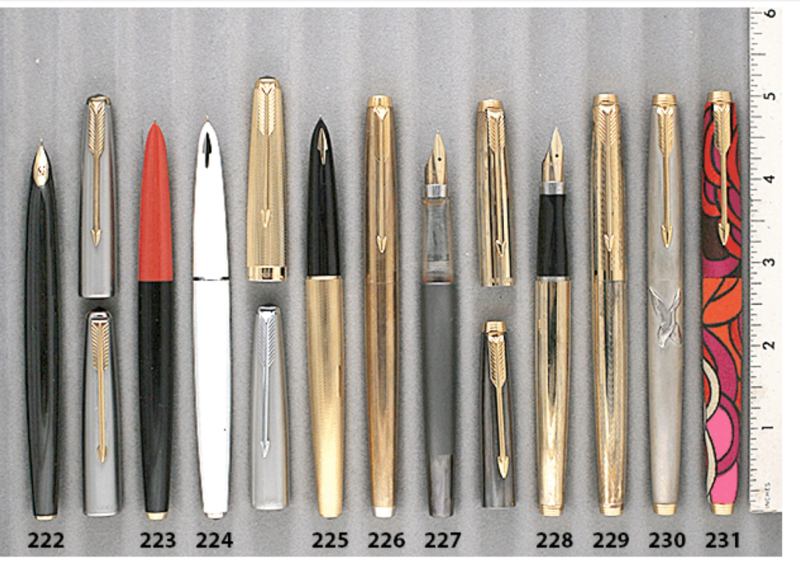 Parker 75 gripping section with indexed chrome-plated ring. What is extraordinary about this triangular gripping section is that it is a prototype of the section not introduced until the manufacture of the pen was transferred to France in 1988, made for the wide feed (no nib/feed unit included), but has the 1964 chrome-plated, indexed ring, never put into production with the section for the wide feed. So we not only have a prototype pen (looking very much like a T-1 75), but a prototype gripping section as well! Near mint. Item #226 in Catalog #84.